Most of the first week of NZTA’s appeal in the High Court against the Board of Inquiry decision to decline resource consent for a Basin Reserve flyover has been taken up with the case of the flyover proponents: first NZTA itself, and then the Wellington City Council, whose submission supported part of NZTA’s case.We thank everyone who attended the High Court during the first week and sat through the NZTA and WCC submissions! But now it’s our turn. Matthew Palmer QC, for Save the Basin and the Mt Victoria Residents’ Association, began presenting our case around Friday lunchtime, and he is currently expected to be continuing to present our case throughout Monday the 27th, and on into Tuesday. Philip Milne will then be presenting the case of The Architectural Centre, before NZTA gets a final right of reply. 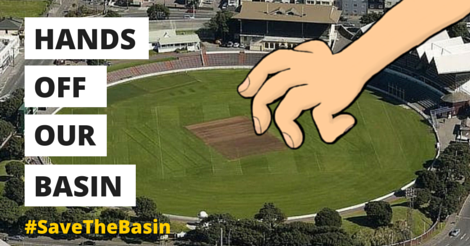 Please help Save the Basin with an Action Station donation! Finally, NZTA, as the appellant, will have the right of reply before the case concludes. Media coverage We understand that the Dominion Post, Radio NZ and Newstalk ZB plan to cover the case. Other media may also cover it. There was a preview of the case in the Dominion Post of Saturday 18 July: http://www.stuff.co.nz/motoring/69988680/basin-reserve-flyover-battle-set-to-ignite-again-in-the-high-court When we might get a decision There is no fixed date for the judge’s decision, and we probably won’t get any advance warning of the decision release date. As a very rough rule of thumb, a decision during the final quarter of 2015 would not be unexpected. See you at the High Court – and please get in touch if you have any questions via stoptheflyover@gmail.com.